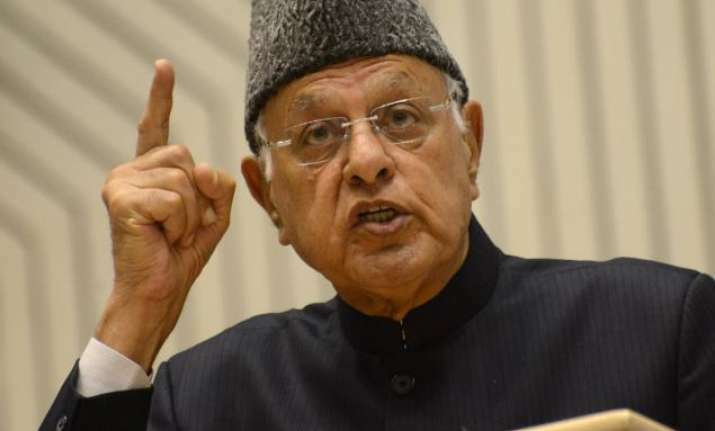 Jammu, Nov 18: Defending his assertion for internal autonomy to both parts of divided Kashmir without obliterating the Line of Control (LoC), National Conference (NC) President Farooq Abdullah on Saturday said if India wants to get Pakistan-administered Kashmir (PoK), let it move towards the LoC with guns. "If India wants to liberate the PoK, let it move towards the LoC with guns," Abdullah told a party meeting in winter capital Jammu, adding that wars were no solution as these bring only death and destruction. Abdullah also reiterated his demand for grant of regional autonomy to different regions in Jammu and Kashmir to assuage the aspirations of people. "J&K is a unique state and needs special dispensation in terms of regional autonomy to satiate the urges of various regions," he said. Without naming the Bharatiya Janata Party (BJP), he lambasted the alleged overt and covert attempts being made to weaken Article 370 and said demand of autonomy was within the framework of the Constitution. He said the NC would not allow the attempts of repealing Article 35-A to succeed. He said its fallout would be more disastrous for Jammu than other two regions of the state. "People will come here to take your land," he said accusing the BJP of raising the issue to make electoral gains and divide the people. He questioned the ruling Jammu and Kashmir Peoples Democratic Party (PDP) for advocating self-rule for Jammu and Kashmir, saying the PDP could not safeguard the state's special status and surrendered fiscal autonomy over GST. "What could have been our own prerogative over tax structure rests with the central GST Council now," he said. He also hit hard at the coalition government for abandoning the border residents, who stand exposed to harsher winter due to lack of shelter. He referred to his recent visit to various parts of the LoC in north Kashmir including Teetwal and Machil and said the border dwellers were facing lots of problems due to failure of the government to provide better roads, communication and electricity facilities to them. "The PDP-BJP alliance will have to pay for all its wrongs," he said, adding that the people were suffering due to non-governance, development deficit and lack of accountability. He alleged that survivors, widows and the families of soldiers, who laid down their lives for the country, were being neglected in the state. Abdullah referred to his visit to the bereaved family of Sohanlal Bhagat, the soldier killed in Manipur, and said the family was totally shattered and devastated. He lamented that none of the ministers in Jammu and Kashmir Government had time to visit the family. "This is how soldiers and their families are treated," he said and mentioned the state funeral accorded by Himachal Pradesh to the soldier killed along with Sohanlal Bhagat in Manipur. He sought constitution of a commission to look into the plight of war widows and families of the killed soldiers. "Army chief General Bipin Rawat must work for this and formulate a report on the condition of war widows to be tabled in Parliament," the NC chief said while assailing those indulging in war mongering. Referring to over-reaction on his recent statement on PoK, Abdullah invoked then Prime Minister Atal Behari Vajpayee saying that the sanctity of LoC could not be trampled by crossing over during Kargil incursion. He also referred to the return of the strategically crucial Haji Peer picket in north Kashmir to Pakistan after India conquered it in 1965. "NC had not advocated this, but the Indian nation as such took this decision," he said.